That’s something that people say all the time. And that statement was quite true for young Josh Adams on Saturday night, in both good and bad ways. It was pretty obvious following Adams’ heat race that he wasn’t going to be second on this night. It was checker or wrecker on Saturday night. And checker he did. “To finish second behind Steve Wallace here last year was a great finish, but we knew we could do a little bit better,” said Adams. “Long runs are what got us last year, so this is what we wanted to concentrate on this year. We wanted to be good on long runs. “Yesterday, when we were qualifying, there were two ways we could go. We figured we could be bad fast in qualifying or bad fast in the race. That was an easy choice. We didn’t qualify the car very well, but that is what I wanted to do. I didn’t want o push the car and instead just let the guys come to me. All eyes were on Josh Adams after his big win at Bristol Motor Speedway on Saturday night. It wasn’t like Adams had a bad 2004. He finished eighth in the point standings and second to Steve Wallace in the Rookie of the Year standings with the UARA Late Model Stock Car Series. When the UARA Series made their first trip to Bristol Motor Speedway, he finished second to Wallace after fighting back from early race struggles. Adams’ family-owned team ran out of money and Adams was forced to sit the year out. 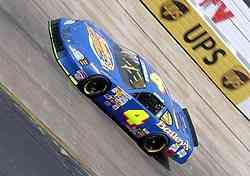 He has run a spot race here and there during the season, but the Bristol event was his first “all out” attack on the track in 2005. And after being the bridesmaid in 2004, he didn’t wanted more. Adams might not have gotten there though, had it not been for a plague that seemed to fall on many of the early front runners. First was Joe Bufford, who led from the start, but got into the wall while passing a lapped car and parked it not too long after. Front-runner Jason York retired with mechanical problems, Mark King got involved in an accident and Matt McCall, the only other driver that looked to be able to stay with Deiny, fell off the pace with tire problems. That left Adams and Deac McCaskill, who both made the race by winning their individual heat races. 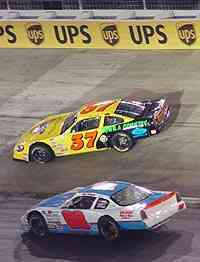 Adams (#37) and Deac McCaskill (#08) had to wait out a late race red flag to find out who would win. McCaskill led late, but on lap 137, Adams charge to the front finally paid off… and it was worth $15,000. 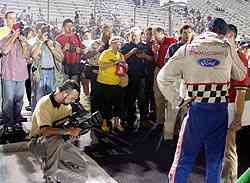 “It is a great feeling to win at Bristol,” said Adams. “It has been tough not racing this year. So this is a good way to come back. This is basically my first race of the year. So this feels great. Frank Deiny Jr. was fast on Saturday, but it didn't last in the race. Adams strategy worked well. And part of it came from a year’s experience at Bristol. “Qualifying kind of got me down because I knew I could have done a better job. But I said ‘you know what, we’ll just go out there and get it done.’ We ended up winning out heat race and everything turned out well. Adams got lucky to make it out of his heat race. With a format that called for just four of the 50-plus cars to be locked in after qualifying, everyone else had to run in heat races. Adams’ heat race, the third one, resembled more of a demolition derby than a 20-lap heat. Adams got shuffled back after contact with another car on the first lap, but was able to work his way back to the front and stay in front of wreck after wreck. McCaskill didn’t think anything of the little bump that cost him the lead. “On the long runs, when the tires got hot, the car just danced all over the track. I was having trouble hitting the apron. That would upset the car. Kyle Grissom finished an impressive third with Ross Furr and Bo Miller rounding out the top-five.